It was a pleasure to see the frontispiece of Arthur Machen’s edited book A Handy Dickens of 1941 appearing in Dale Nelson’s guest post of 8 April. What a warm hearted depiction of Dickens’ characters is displayed in this coloured pen and ink sketch, featuring recognisable or generalised Dickensian characters in their glory. Surely the artist’s affectionate vignettes of Dickens’ imaginative world - with nods to nineteenth century illustrators - would be a delight for all to enjoy? The publishers, Constable loved it. But Arthur Machen, the editor of the book, had nothing good to say about this illustration by the famous artist Edward Ardizzone. Certainly the gothic arch in the centre of the illustration favours the use of the letter ‘A’ rather than the word ‘The’. 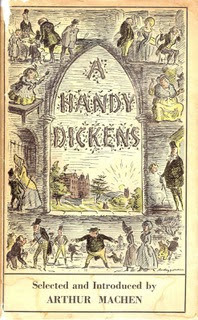 Was it important that the ‘The Handy Dickens’ title ended up as ‘A Handy Dickens’, and can one accept Machen’s view that the illustrator acting alone had the power to do this? Machen felt strongly about the frontispiece. He also felt strongly that the publishers missed a trick by bringing out the book three or four days before Christmas and in doing so failed to cash in on Christmas sales. In defence of Machen one can see that the illustration did not meet his precise requirements in what would be his final book as a content editor and preface writer. Maybe an author is allowed to be tetchy about the presentation of his last book (Machen was 77 when this work was published). Machen is very hard on Edward Ardizzone. One can imagine he was too busy undertaking his duties as War Artist in 1941 to fulfil the precise brief of producing an immaculate frontispiece to A Handy Dickens. He had much other business to attend to. Did it really matter that the frontispiece did not map on to the episodes selected by Machen? Taken as a whole, despite dark street corners and apparent prison gates, the sketches Ardizzone produced for the frontispiece to A Handy Dickens are serene in a time of global war. Perhaps some notion of serenity was what he wished to see, and also share with readers, at that time of conflict. Thanks, Nick, for an interesting post. Let me add one clarification. The scan I added to Dale Nelson's post, which is also reproduced above, is of the front cover of the dust-wrapper. The frontispiece is basically the same Ardizzone illustration but without any borders and without the "Selected and Introduced by ARTHUR MACHEN" phrase.